October is Breast Cancer Awareness Month. It is the time of year when the major breast cancer charities campaign in order to increase awareness of the disease, and also hold fundraisers for research into the cause, prevention, diagnosis, treatment, and hopefully an eventual cure of breast cancer. Over the years this has become a worldwide phenomenon, and everyone has their own way of honoring their loved ones who have lost their lives to cancer, or of celebrating their own ability to survive the disease. 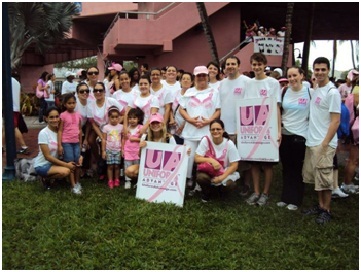 Many organizations hold 5k walk/runs, like the American Cancer Society and Susan G Komen. 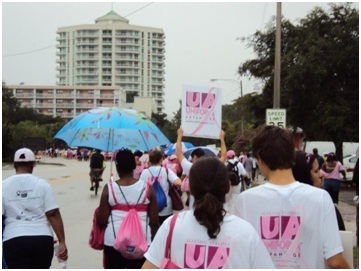 As you may already know, our sister company, Uniform Advantage took part in this year’s Making Strides for Breast Cancer 5K walk, in order to raise money to fund Breast Cancer research. As it stands, our team has raised over $2,300 for the cause, and after the company matches with its own money, we will have raised close to (if not more than) our goal of $5,000! Thank you everyone who came out and for showing your support! How can you get involved in one of these events? Click on any of the links below (or find any other one of your choosing), and see what you’d be interested in participating in, and be sure to make a donation for the cause. ← Stop, Drop, and Roll! 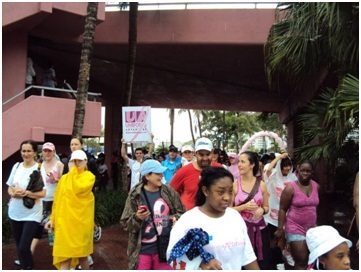 I am honored I was able to participate in this walk with Chef Uniforms! Even though it poured, this was for a great cause and I was glad to be a part of this special occasion!